For the average traveler, hotel rooms don’t need to be all that big. As long as they have the essentials in them, which when you’re travelling usually means a bed and a bathroom, you’re good. But when you’re living at home in a small space, it can be hard to figure out how to include all the things you need. 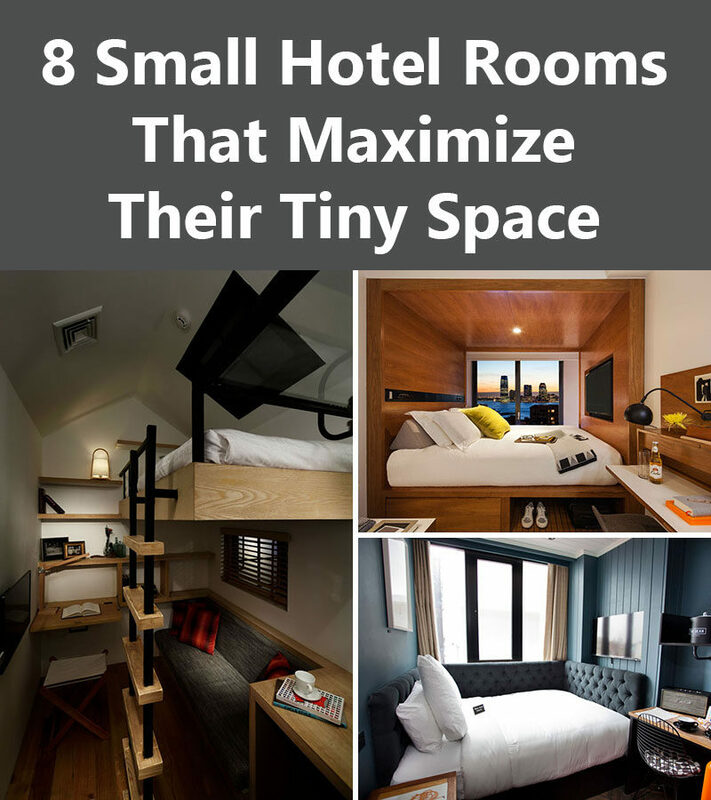 Today we’re turning to small hotel rooms that use all available space to create cozy functional rooms that have design ideas you can use your own tiny home. 1. At this hotel, you sleep in your very own mini house. A lofted bed leaves space underneath for a couch, and a fold up desk creates a work space that’s just the right size for writing, working on a laptop, or doing some sketching. There’s also a table next to the couch for when you need a little extra work space. Inspiration from the Tama Hotel designed by FHAMS. 2. Despite this hotel room’s tiny size it still manages to sleep two people – one on the main level and another in the loft above. There’s also a proper desk, a bathroom, a sink, and counter space that also could double as a second desk if necessary. See more photos of this hotel room, here. Michelberger Hotel designed by Werner Aisslinger. 3. 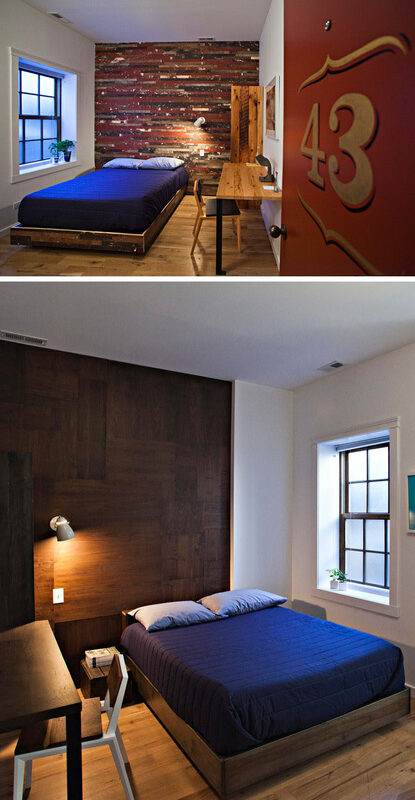 Building the bed right into the wall of this small hotel room creates a separate sleeping space in the room and makes the living space feel a little more roomy. The built-in bed also creates a storage solution under the bed, perfect for storing shoes, bags, and whatever else you want to have put away but easily accessible. 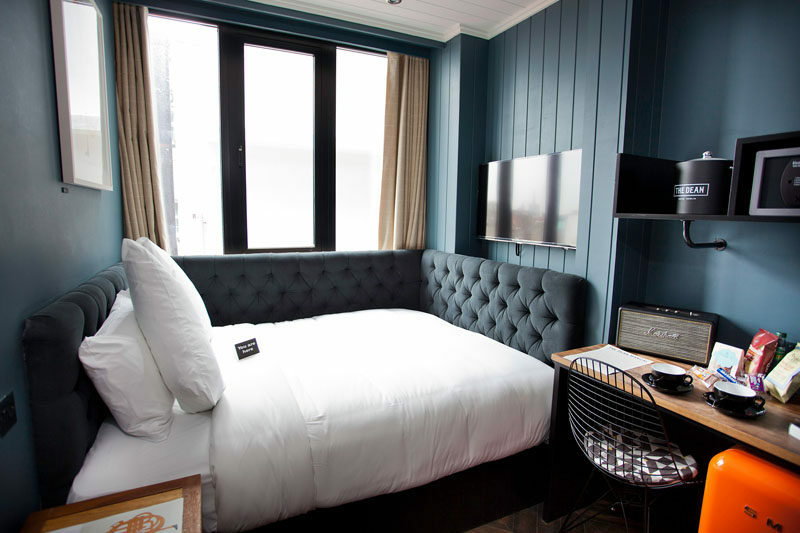 See more photos of the Arlo Hotel room, here. 4. Simple modern decor helps these tiny hotel rooms feel a bit more spacious and using fabric curtains as a divider between the bedroom and the bathroom softens the space and makes it feel cozier. The long mirror above the bed also makes the room feel larger and more open, and the window along the back wall of the bathroom draws the eyes deeper into the room to make it feel even bigger. 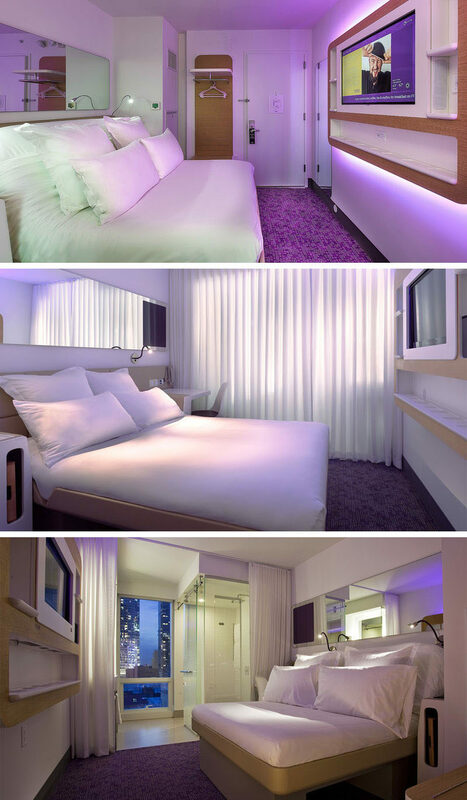 Inspiration from Yotel by YO! Company. 5. This tiny hotel room has a bed that doubles as a couch during the day, a desk, and a fully stocked mini fridge. Unique decor like the speakers, the bright mini fridge, the wrap around headboard, and the industrial-style shelving give the space personality and life to make it a more customized space. Inspiration from the Mod pod at the Dean Hotel in Dublin. 6. These simple hotel rooms have a few pops of color throughout them to inject some fun into the room and the fold down desk keeps the space functional and organized. The curved paneled structure conceals the bathroom and adds an architectural detail to the room while also providing an essential requirement. 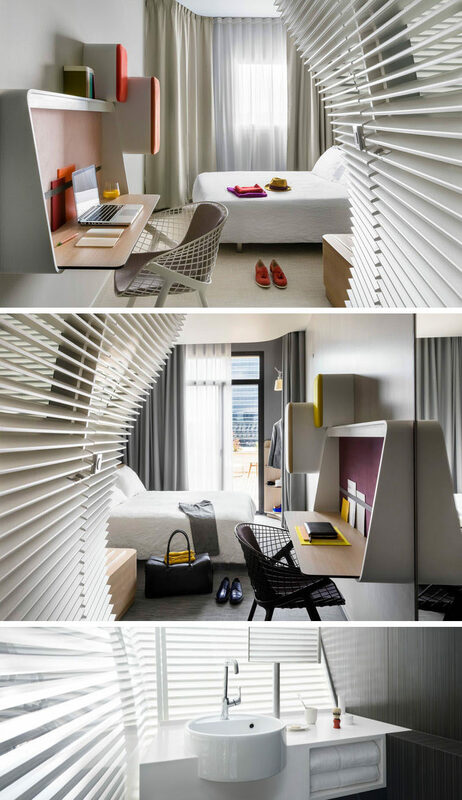 Inspiration from the Okko hotel rooms designed by Patrick Norguet. Photography by Jérôme Galland. 7. 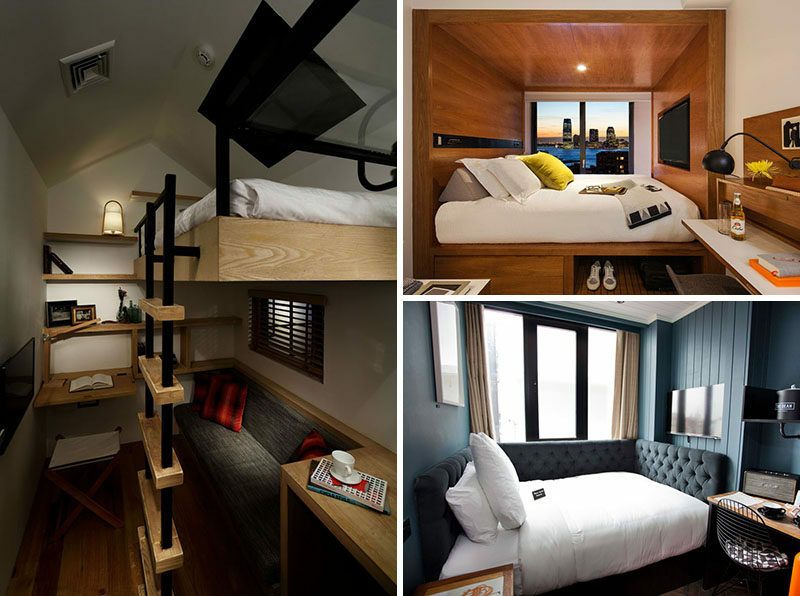 These small hotel rooms make the most of their space with multi-functional furniture. The bed doubles as a couch and general relaxing area, the coat rack doubles as a bench and storage area with baskets underneath and coat hangers up top, and the table can be used as both a desk and a dining table when necessary. Inspiration from the Tribute Hotel designed by Alex Jones of Spawton Architecture. 8. Lots of wood elements in these hotel rooms and the use of warm colors make the rooms feel cozy and inviting. They also have large windows and high ceilings to let in natural light. Inspiration from the Longman and Eagle designed by James Beard of Land And Sea Dept. Photography by Clayton Hauck and Carolina Rodriguez.